With nearly 200 built-in templates, Pages ‘09 lets you get to work quickly on everything from business letters to screenplays. But if Pages doesn’t have the right template for your next document, you have two choices: create your own or snag one online––sometimes free of charge. 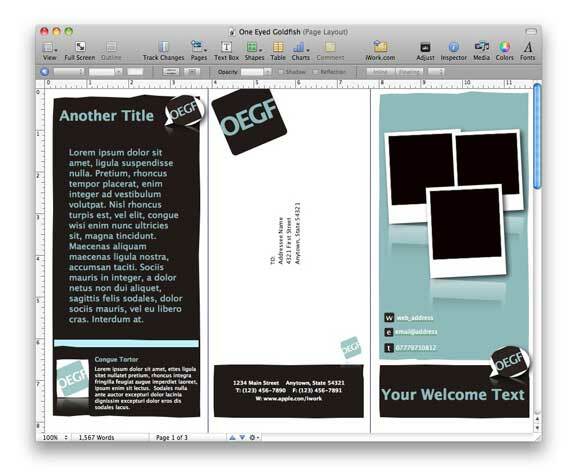 This guide will help you find new templates to expand your page-layout repetoire. Some templates must be installed to appear in the My Templates section of the Pages Template Chooser, others are simply customized Pages files that you can edit. Each brings new styles to your project, and some provide models for unusual documents. Jumsoft offers a collection of some 100 templates sporting clean, modern designs for a wide range of projects. There are templates for photo books, advertisements, newspapers, and more. Each template contains up to 10 sections in a variety of sizes, depending on the type of document. Jumsoft also offers a collection of 20 business-themed templates and a collection of clip-art for Pages and other iWork applications. All products require Pages ’08 or later. Prices: Individual themes, $19 to $29; collection of 100 general-use templates, $39; 20 business templates, $99; collection of 65 sale-priced templates, $10; bundle of 1000 clip-art illustrations, $39. One Eyed Goldfish’s 22 free templates bring bold designs and bright colors to business and creative documents. Some designs offer themed letters, brochures, or invoices for printing, but others provide fewer choices or are intended for online or electronic reading, so make sure templates suit your needs before downloading. All themes require Pages ’06 or later. Prices: All themes are free, but donations are accepted. One Eyed Goldfish’s Matchstick template. Inkd and StockLayouts are both worth a look if you need a particular business-oriented design quickly. Most of their templates are intended for very specific uses, such as a Chinese restaurant menu or a dental office newsletter, making them similar to the custom work of professional designers rather than generic, general-purpose templates. Note that when you buy a Pages template from either site, you may re-download the same template for use with Word, InDesign, and other page design applications at no additional charge. Inkd sells more than 1500 templates that bring a hip, artistic look to your documents. Designs are stylish and surprising, boasting a blend of retro and contemporary sensibilities. 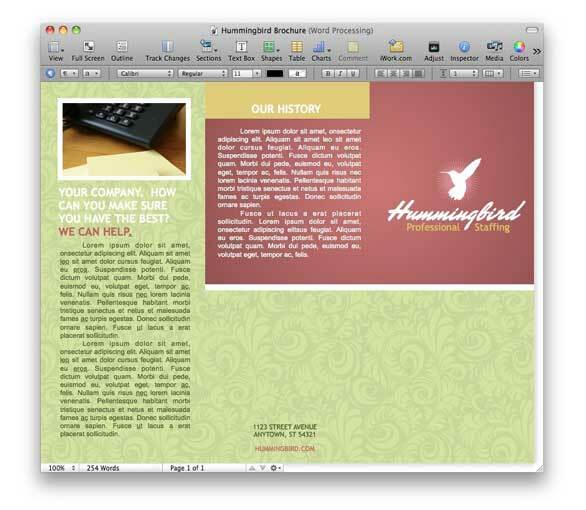 Templates will work best in Pages ’08 or later, and are available individually or through subscription plans that allow limited access to all templates. Prices: Individual templates, $29 to $99; subscriptions start at $199 for three months. Inkd’s free sample brochure template. Most of StockLayouts’ 900 templates are more conventional looking than Inkd’s catalog, but all are just as striking and well designed. Templates require Pages ’08 or better and are sold individually, in groups of three or more at a discount, or through subscription plans that allow limited access to all templates. Prices: Individual templates, $39 to $99; sets of three or more templates are available at a 30 percent discount; subscriptions start at $399 for three months. Other Pages template sites include Keynote Pro, Foozoo Design, and iWork Community, which offers over 300 free Pages templates. Some lack explicit installation instructions, so finding the right design in a format that works for you can be hit-or-miss. These days, designing simple and professional-looking documents is easy and fun. Using third-party Pages templates can speed the process by focusing your concentration on the content of your document while letting an attractive, reasonably priced design boost the visuals.